We’d love your help. Let us know what’s wrong with this preview of The Map Thief by Michael Blanding. Maps have long exerted a special fascination on viewers—both as beautiful works of art and as practical tools to navigate the world. But to those who collect them, the map trade can be a cutthroat business, inhabited by quirky and sometimes disreputable characters in search of a finite number of extremely rare objects. Once considered a respectable antiquarian map dealer, E. Forbes Smiley spent years doubling as a map thief —until he was finally arrested slipping maps out of books in the Yale University library. The Map Thief delves into the untold history of this fascinating high-stakes criminal and the inside story of the industry that consumed him. To ask other readers questions about The Map Thief, please sign up. I do not read much nonfiction because I like a story that really pulls me along, one full of strange characters and intriguing plot twists. But that's exactly why I enjoyed THE MAP THIEF so much. The story of Forbes Smiley, who went from prestigious dealer of rare maps to thief and convict, is a classic example of truth being stranger than fiction. You don't need to be a map aficionado, Blanding guides you through the world of rare maps which is often reminiscent of fine art, with collectors and I do not read much nonfiction because I like a story that really pulls me along, one full of strange characters and intriguing plot twists. But that's exactly why I enjoyed THE MAP THIEF so much. The story of Forbes Smiley, who went from prestigious dealer of rare maps to thief and convict, is a classic example of truth being stranger than fiction. You don't need to be a map aficionado, Blanding guides you through the world of rare maps which is often reminiscent of fine art, with collectors and dealers scheming to get the best pieces. I admit, I was usually anxious to get back to the action of the present-day during some of the sections on the history of maps and mapmaking, but the book moves you quickly along and does a good job of keeping you informed as you go. Smiley is indeed a character unlike any other. From the beginning he's an unusual and eclectic type. And the last third of the book where the issue of theft of rare maps is covered in detail was particularly fascinating to me. If you like the kind of nonfiction that moves quickly and teaches you about something you never knew, this is a great pick. A well written blend of history and crime that will strike terror into the hearts of most rare book librarians, including me. The Map Thief has so many compelling things to offer: the history of cartography, insight into the world of rare and antique map dealing, and a true crime story. My favorite aspect was the detailed chronicle of how early navigators discovered new coastlines and continents, developing mapmaking to aide in exploration. During the time of cartographical renaissance, America was a blank space on a map that would eventually be filled in as travelers ventured further inland. As more sophisticated tech The Map Thief has so many compelling things to offer: the history of cartography, insight into the world of rare and antique map dealing, and a true crime story. My favorite aspect was the detailed chronicle of how early navigators discovered new coastlines and continents, developing mapmaking to aide in exploration. During the time of cartographical renaissance, America was a blank space on a map that would eventually be filled in as travelers ventured further inland. As more sophisticated techniques were developed, the maps created were more detailed and varied. Then there is the contemporary trade of these maps, and at the forefront of this is E. Forbes Smiley III. An reputable map dealer, he educated himself on the history of his ware in various libraries. Alas, these institutions would eventually become his victims. The book follows him from his early days establishing relationships with collectors, to the time when he became so financially desperate, he resorted to stealing rare and highly valuable maps from library collections. Smiley is the kind of guy you want to like, but end up despising, and the one aspect of the book that I didn’t particularly care for detailed his disputes with the townspeople in the village where he kept a summer home. Otherwise, I feel like I learned a great deal about the history of maps, their provenance, and their value. I found it very interesting how the institutions that Smiley stole from had to prove whether the maps Smiley stole were from their collections and the various techniques use to prosecute him. Overall, this is a fascinating combination history and scandal. I won this book in a goodreads firstreads drawing. This is really a two part book. Part of it deals with maps, map-making, and the history of cartography and map stealing. The other part is a biography of a famous map thief, E. Forbes Smiley III. The part that dealt with the history of cartography, and the influence of maps and mapmakers on history I found fascinating. I also enjoyed the parts about business and hobby of map collecting. The biography, was vague, creating a narrative that even the I won this book in a goodreads firstreads drawing. The part that dealt with the history of cartography, and the influence of maps and mapmakers on history I found fascinating. I also enjoyed the parts about business and hobby of map collecting. The biography, was vague, creating a narrative that even the author seemed to doubt was authentic. I found the pictures of maps very interesting. The list of maps stolen from libraries around the world and still missing was infuriating. I could not manage to stay interested in this. I gave up early in Ch 6. I think I expected the book to focus more on the thefts and how he was caught. As of Ch 6, we had just gotten to 1989, when his gallery was - supposedly - cleaned out by thieves, though the building superintendent, still around when the author was researching, knew nothing about any such theft. In skimming forward, I saw a lot about some community that the thief built, spending fortunes he may not have had. There were some i I could not manage to stay interested in this. I gave up early in Ch 6. I think I expected the book to focus more on the thefts and how he was caught. As of Ch 6, we had just gotten to 1989, when his gallery was - supposedly - cleaned out by thieves, though the building superintendent, still around when the author was researching, knew nothing about any such theft. In skimming forward, I saw a lot about some community that the thief built, spending fortunes he may not have had. I read this book in 36 hours-- which is not something I ever thought I'd say about a book that deals with the antiquarian map trade. But Blanding has written this such that I couldn't put it down-- the end of his chapters, in particular, propelled me right forward to the next. A book that's fun to read and also teaches you something? (I haven't thought of maps the same way since.) Brilliant. 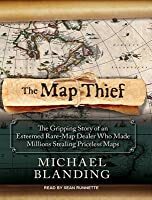 The Map Thief by Michael Blanding is a very highly recommended nonfiction account of a map dealer who stole hundreds of antique maps from collections, as well as a history lesson about some of the maps he stole. You don't have to love old maps to fully appreciate The Map Thief: The Gripping Story of an Esteemed Rare-Map Dealer Who Made Millions Stealing Priceless Maps by Michael Blanding, but it helps if you at least appreciate them and enjoy reading about the history behind the creation of some The Map Thief by Michael Blanding is a very highly recommended nonfiction account of a map dealer who stole hundreds of antique maps from collections, as well as a history lesson about some of the maps he stole. You don't have to love old maps to fully appreciate The Map Thief: The Gripping Story of an Esteemed Rare-Map Dealer Who Made Millions Stealing Priceless Maps by Michael Blanding, but it helps if you at least appreciate them and enjoy reading about the history behind the creation of some of the maps. E. Forbes Smiley III was an antiquarian map dealer who was also a thief. He stole an unknown quantity of maps, perhaps over 200, from libraries and collections, and then sold these public treasures in order to finance his lifestyle. Since the number of actual rare maps Smiley stole is unknown (although a list of known stolen maps from around the world is included), it is difficult to put a total price on what he stole but it was certainly in the millions. Blanding interviewed Smiley at the beginning of the book, but later Smiley tried to distance himself from the publishing of this book. At that point Blanding had already been talking to "a wider circle of people, investigating a paper trail of court documents, and spending hours sifting through library archives and volumes of old maps." With or without Smiley's further cooperation, Blandings began to piece together "an answer to my biggest question: Why did a respected map dealer at the height of his profession betray those closest to him—and deface the artifacts he spent his life preserving? The more I researched his story, however, the more questions I uncovered—to the point where I began to suspect that his reasons for cutting off our correspondence had less to do with the advice of his advisor or the impact on his family, and more to do with his own fears of exposing secrets he has never revealed." 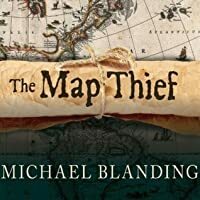 Since Blanding also has a love of old and rare maps he is a good author to tell this story which involves the history of the maps themselves and the intrigue of Smiley's prolonged theft of so many maps over several years. Blanding writes, "I read about him in The New Yorker in October 2005 with fascination—first, for the maps themselves, these historical documents that were at once beautiful and flawed, and second, for this strange character at the center of the crime, so mysterious in his decision to despoil the world he loved." After the news of Smiley's arrest for stealing maps broke and the word was out to curators, "One by one, they began to call with panicked reports of maps missing from books in their collections as well. As they did, more questions began to reverberate through the insular world of map libraries, collectors, and dealers: Why had a respected and successful antiquarian dealer turned against those who trusted him and stolen the things he loved most? And how long had he been getting away with it?" This fascinating book not only covers the deeply flawed and contradictory personality of Smiley and his lifestyle, it also does an excellent job explaining the history, provenance, and importance of various maps and precisely why they are so valuable. He talks to other map dealers, clients, and curators. The book includes an 8 page color insert and black and white photos throughout, chapter notes, and an index. As mentioned, there is a list of all the maps that are known to be missing from libraries and public collections worldwide. Disclosure: My Kindle edition was courtesy of Gotham Books for review purposes. When I read the blurb on PW about Blanding's book, it took me a while to determine if the book was fiction or nonfiction. Either way, I knew that I wanted to read it. Blanding has done so much research surrounding the case of E. Forbes Smiley III, dealer-of-rare-maps-turned thief. This is not just a true crime novel. It's more extensive than that. It's also an introduction into the profession of map dealers with a sneak peak into the dynamics among various related professions. Maps are created a When I read the blurb on PW about Blanding's book, it took me a while to determine if the book was fiction or nonfiction. Either way, I knew that I wanted to read it. Blanding has done so much research surrounding the case of E. Forbes Smiley III, dealer-of-rare-maps-turned thief. This is not just a true crime novel. It's more extensive than that. It's also an introduction into the profession of map dealers with a sneak peak into the dynamics among various related professions. Maps are created and circulated by surveyors, engravers, printers, publishers, merchants, military leaders, politicians, and regent. Then when they become cultural artifacts they enter a dynamic where dealers, collectors, curators, restorers, and librarians handle them. Then throw in plagiarism, vandalism, theft with a smattering of shady business deals, and this book becomes a thriller. The suspense was so palpable, that I had to put the book down at times so that I could catch my breath. Even though this book touches on an array of those who use, care for and/or admire maps, it also scrutinizes Smiley's life. I was interested in trying to figure out what character traits and what actions led him to steal such rare items and in such great quantities. And even though I have my hypothesis, Blanding makes it clear that it's no easy task to judge another person. Reading the book makes me want to take a self-inventory that asks me to correct personality excesses before I end up damaging my finances, my health, my colleagues, my friendships and my family. Forbes was exceptional even at a young age, but he can still stand as Every Man and offer us all a cautionary tale. That being said, I don't want to "use" Smiley entirely for my own ends. I wish Smiley a measure of peace. There but the grace of God go I. But the book wasn't primarily a zen meditation. Boy, was I upset while I read the unfolding of his crimes. God bless librarians and curators. May they get budget increases to help them improve security! The Map Thief is the account of a dealer in antique maps who betrays his calling and the scholarly community by stealing rare and irreplaceable maps from libraries and universities for his own profit. The account of this terrible series of crimes is a page-turning story. 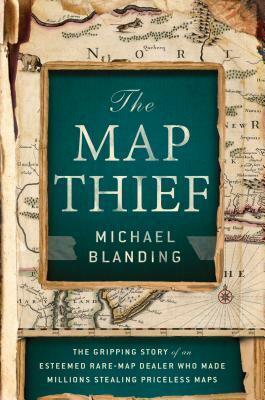 Blanding’s knowledge of the history of map-making and the map trade makes it a fascinating book on many levels. An interesting non violent true crime story of how one man stole large numbers of historic maps from libraries and museums and resold them to other dealers or collectors. Naomi Sato (f, librarian) had spotted Edward Forbes Smiley III in the Beinecke Rare Book & Manuscript Library (Yale University) & told her supervisor Ellen Cordes about his strange behavior while he was looking at books of old maps. She also found an X-acto knife blade on the floor by where he had been seated. The case began to unfold. Ralph Mannarino (Yale head of security) was called & he in turn called Detective Martin Buonfiglio (New Haven P/D) who began his investigation after n Naomi Sato (f, librarian) had spotted Edward Forbes Smiley III in the Beinecke Rare Book & Manuscript Library (Yale University) & told her supervisor Ellen Cordes about his strange behavior while he was looking at books of old maps. She also found an X-acto knife blade on the floor by where he had been seated. The case began to unfold. Ralph Mannarino (Yale head of security) was called & he in turn called Detective Martin Buonfiglio (New Haven P/D) who began his investigation after notifying his superior Lieutenant Bill Holohan (supervisor, New Haven P/D). The plot thickens & Edward Forbes Smiley III is found in possession of a map of John Smith historic voyage & the founding of New England (Jamestown). His attaché case contained many more incriminating map artifacts. Try as he might his lies got him nowhere & he was arrested on 6/8/2005. The big $2.3 million question is; will the maps Edward Forbes Smiley III stole be sold, destroyed, found/never found (recovered)? How will life his turn out? My undergrad is history. I never realized how maps fit in to the big picture. This was a fascinating book to read, given time I plan on exploring my unknown world of maps. Awesome book cover, great pictures, illustrations, font & writing style. A very well written mysterious crime filled thriller book jammed packed full of historical facts of an obsessed antique map thief. It was very easy to read/follow & never a dull moment from start/finish. No grammar errors, repetitive or out of line sequence sentences. Lots of frightening & unique scenarios & a great set of characters to keep track of. This would make a great crime spoof drama type movie or mini TV series. A book you won’t want to put down. No doubt in my mind a very easy rating of 5 stars for this book. Maps, to me, are simply a navigation tool to get a person from point a to point b. The idea that you would collect, steal or even write a book about maps is completely foreign to me. All that to say, if you are going to get me to read a book about maps, it better be a really good book. The Map Thief is the true story of E. Forbes Smiley III, a map dealer turned map thief. Smiley's story is interspersed with a history of maps, his New England upbringing, rise in the ranks of his profession and ultimately his turn to a life of theft. His drive to be successful in his professional is about as relatable as it gets. And yet, when contrasted with his extravagant life style and self-centered thinking, you aren't surprised that Smiley's life spun out of control. The Map Thief was well researched, well written and makes an emotional connection with readers. At times you sympathize deeply with Smiley and other times you want to slap him silly. If you were watching a sitcom and a character started talking about how interested he was in antiquarian maps, that would probably be the writers sending a signal that the character was supposed to be boring. However, those writers would be wrong because apparently the antiquarian map world is kinda crazy. In addition to telling the story of an esteemed map collector/dealer who turned to theft, Blanding's book gives lots of information about famous historical maps and makes points I had never th If you were watching a sitcom and a character started talking about how interested he was in antiquarian maps, that would probably be the writers sending a signal that the character was supposed to be boring. However, those writers would be wrong because apparently the antiquarian map world is kinda crazy. In addition to telling the story of an esteemed map collector/dealer who turned to theft, Blanding's book gives lots of information about famous historical maps and makes points I had never thought about, like the way that maps can tell a story and the way they contain editorial information and differ based on who made them. Though he was once part of an elite circle of antiquarian map dealers, E. Forbes Smiley’s career came to an abrupt end when he was caught stealing maps from the Yale University library. In The Map Thief, Michael Blanding details not only Smiley’s elusive career and eventual downfall, but digs deep into the fascinating world of rare maps. The Map Thief catches readers from the start as it begins with Smiley’s end. With detail that rivals the best heist films, Blanding describes the steps Smiley to Though he was once part of an elite circle of antiquarian map dealers, E. Forbes Smiley’s career came to an abrupt end when he was caught stealing maps from the Yale University library. In The Map Thief, Michael Blanding details not only Smiley’s elusive career and eventual downfall, but digs deep into the fascinating world of rare maps. The Map Thief catches readers from the start as it begins with Smiley’s end. With detail that rivals the best heist films, Blanding describes the steps Smiley took on the day he was caught and the glaring mistake he made that set the library staff, and eventually the police, on his trail. From there, the book takes makes a perfect parallel into the world of antiquarian maps while also becoming somewhat of a history of Smiley’s life. As Blanding discusses the paths that led Smiley toward map dealing, he details the oldest and rarest maps the man was aching to find. I'm a sucker for maps. Always have been, probably always will be. Topographical maps, especially, but here the history of maps is what drew me in. And then, thinking of a few people who I could see making decisions like Smiley's? Kept me turning the pages. Being a librarian/archivist by training and a map-lover by birth this book reads like a horror story to me. I am really glad this was documented and that many of the places I have worked have changed their practices in light of thefts like the ones mentioned in the book. It is so sad that some people violate the trust of all of us in defacing cultural artifacts for personal gain. A great audiobook - my mind wandered at times, but less so had I been reading this book. Liked hearing so much about libraries, and their collections. Certainly learned a great deal about maps and cartography. I like it when nomfiction reads like fiction and michael blanding has done a good job of telling the story of forbes smiley andhis roadto crime. and being a librarian I get the pain of losing treasured items. good read. A true story of the past and present, of greed and land grabs, boorishness and betrayal, of the shaping of nations and the preservation of power. You don't have to like geography or history or crime stories or maps to enjoy this telling but, if you do, you are in for a hell of a treat. An in-depth look at the world of rare map collectors, the origin and importance of many old maps and how a respected dealer stole (and sold) over 100 rare maps from libraries and universities. This is a fascinating look into the world of collectors, maps and libraries. Blending reports this story with a clear chronology and is careful to reveal the humanity of all who are involved.